↑ Lund, Morten (January 21, 2014). 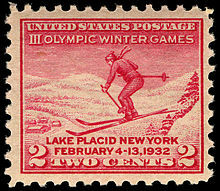 "How the Olympics Came to a Sleepy Adirondack Village". International Skiing History Association. मूल से 25 December 2018 को पुरालेखित. अभिगमन तिथि March 19, 2017. ↑ Strege, Dave (August 21, 2013). "Mountain High makeover". Orange County Register. मूल से 25 December 2018 को पुरालेखित. अभिगमन तिथि August 17, 2016.